base with a rich walnut finish. Also features optically clear, UV protected glass. allowing it to conform to the round shape of the dome. Inside measurements 10x10x9-1/2. Desktop baseball cap/hat acrylic case with black base. and clear lid. This is not one of those cheap, mass produced display cases. Wall mount baseball cap/hat acrylic case with black base and gold risers. Includes wall mounting bracket that attaches to the display case. Acrylic single baseball cap display case with black stackable base. to a high luster. This is not one of those cheap, mass produced display cases. The Ball Qube CapIt Hat Holder fits all cap sizes. 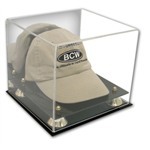 Whether your need CapIt cap display cases to house your personal hats or you want one to protect an autographed cap, CapIt hat showcases allow you to both protect your hat from UV rays while displaying it proudly on your shelf or desk. Price includes 1 free nameplate. Custom made acrylic stand to hold a single baseball cap - hat holds the cap up off the desktop. a round base to prevent the stand from falling over. You can display the cap in a variety of positions. Includes wall mounting hardware - bracket. Cap /Hat display case designed to hold 1 baseball cap folded in. protected glass. The back and base are mirrored so you can see the entire cap. Interior dimensions are approx 8"L x 9"W x 6"H.
Wall mount Cap / Hat glass display case designed to hold 1 baseball cap folded in. It features a mirrored back, furniture grade wood frame and real UV protected glass. Includes 1 free nameplate. Interior dimensions are approx 8 x 10 x 6. Our unique hinged design allows for easy access. Mounting hardware is included. 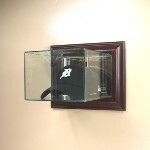 Wall mount Cap / Hat glass display case designed to hold 1 baseball cap folded in. It features a mirrored back, furniture grade wood frame and real UV protected glass. Interior dimensions are approx 8 x 10 x 6. Our unique hinged design allows for easy access. traditional engraved nameplate - plaque, please call or email us. 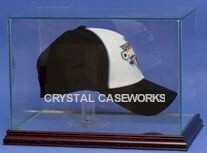 Cap/Hat display case designed to hold 1 full size open baseball cap. It features a removable - repositionable custom hat stand to hold the hat up off the floor. It features a furniture grade wood base and real UV protected glass. The base AND BACK PANEL are now mirrored so you can see the entire cap. Interior dimensions are approx 12"L x 8"W x 8"H.
a wood base with your choice of finishes and real UV protected glass with a mirrored floor and back panel. Includes 1 free nameplate. Interior dimensions are 12"L x 8"W x 8"H.
Interior dimensions are 12"L x 8"W x 8"H.
Wall mount Cap / Hat glass display case designed to hold 1 baseball cap fully open. Interior dimensions are approx 12 x 8 x 8. Our unique hinged design allows for easy access. Includes 1 free nameplate. Mounting hardware is included.